This panini was soo good. 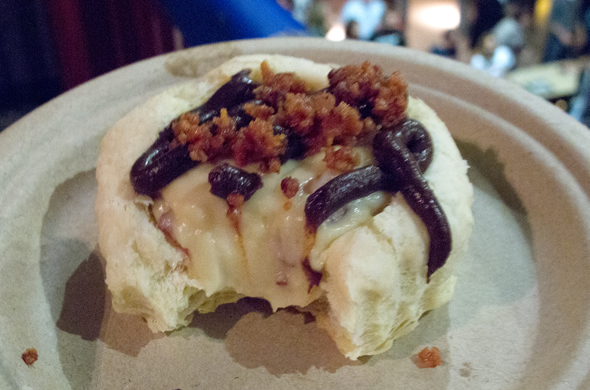 I mean, seriously, how can you go wrong with bacon, cheese, and something sweet? It was a really quick dinner but now that I think about it, this would be a good brunchy kind of dish because of the bacon. The peach compote has a sweet juicy flavor with a tiny zip to it…it isn’t spicy by any means. It could totally handle some jalepenos if you wanted spice. The peaches cook down considerably so even with just 2 peaches, there wasn’t much left over after making 2 sandwiches. It would be good on a cheese plate or on a crostini too. 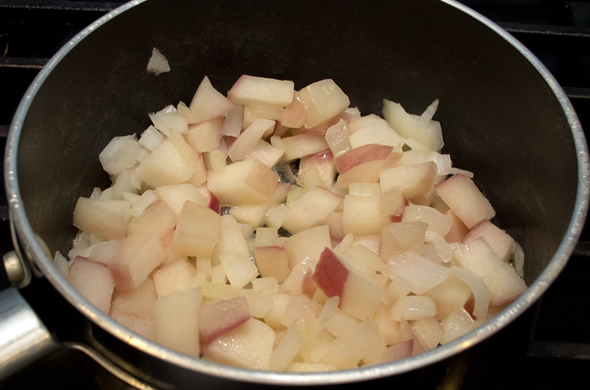 Add peaches, onions,and 3 tbs of water to a small pot over medium heat. Pan fry bacon until crisp. Stir peaches and add red pepper flakes and brown sugar. 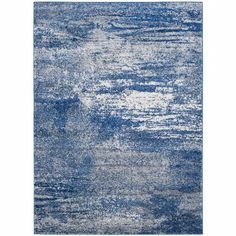 It will be soft and will have reduced a bit. The onions & peaches will have broken down by now. Peach compote cooks for about 10 minutes, but can be kept warm while everything else gets prepped. 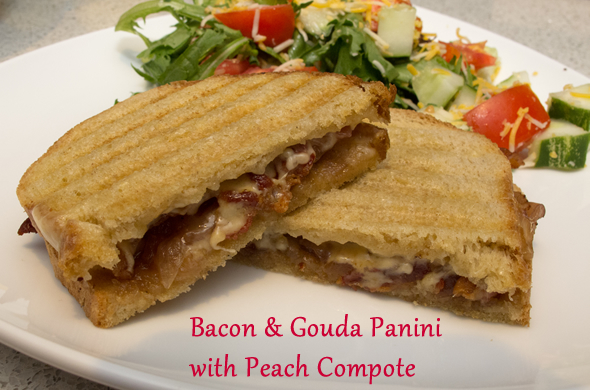 Assemble sandwiches with cheese, bacon, and spread peach compote onto one side of the bread. Pan fry or press sandwiches until cheese melts and bread crisps. (keep warm in the oven if making them in batches). I loved this. I kept it simple so there wouldn’t be too many competing flavors but I usually think “the more the merrier” when it comes to a sandwich. I would like some tomato slices or greens in this. Ham, prosciutto, or pancetta would all be good substitutions for the bacon. 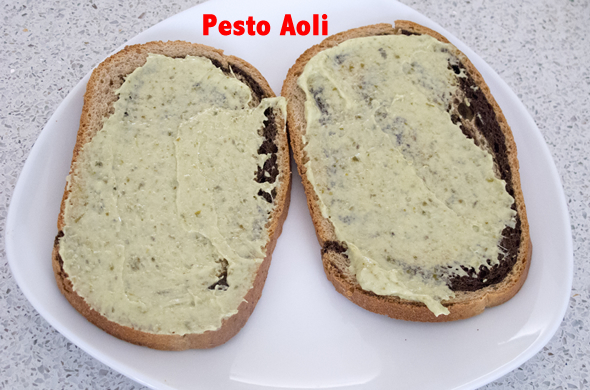 It would be great as a regular sandwich without toasting it, or having it on ciabatta. 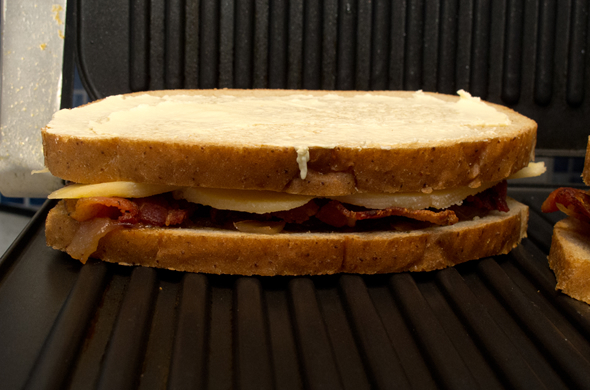 Paninis are such simple dinners. The peach compote would hold up a few days in the fridge if making it in advance. I think this turned my sandwich into something special. I would be a grilled cheese with bacon if I hadn’t added it in there. 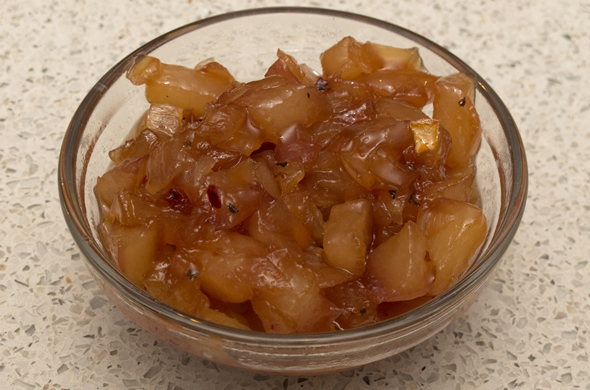 Peach compote would be a good use if any of your peaches or nectarines get a bit squishy. Want more panini ideas? This Italian Grilled Cheese is a super easy dinner. This Turkey, Cranberry, & Brie Panini is great if you’re inching towards fall. Top-your-own Chicken & Biscuits is a fun dinner sandwich too. 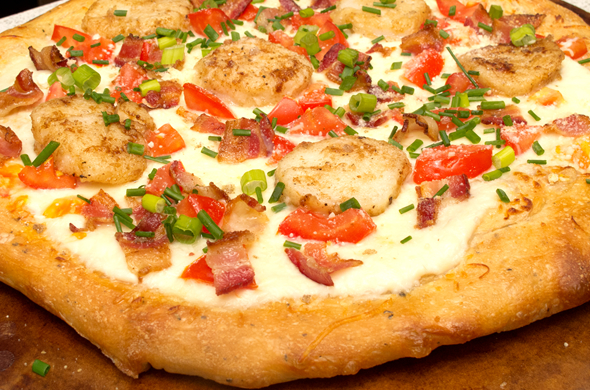 I made this scallop BLT pizza because I love just about anything on pizza. I mean, have you seen all the pizza toppings I’ve fallen in love with? This combo of scallops, bacon, and alfredo provides the luscious and decadent part while the tomatoes and arugula balance it out with freshness. We had a great scallop pizza last year in Maine for our anniversary. I love topping pizzas with raw greens (like this Greek one, or this BLT one, or Big Mac pizza, or this prosciutto fontina arugula one) but if that’s not your thing either spinach or arugula would be great chopped up and cooked on the pizza. Pan fry the bacon until crisp. Remove from heat to drain and chop up. 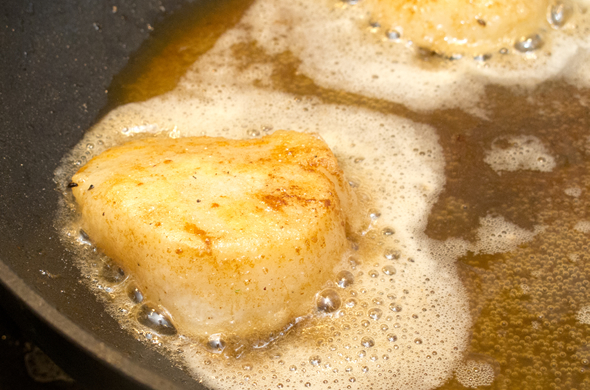 Rinse scallops and remove the connective tissue on each one, if there is any. Pat dry. 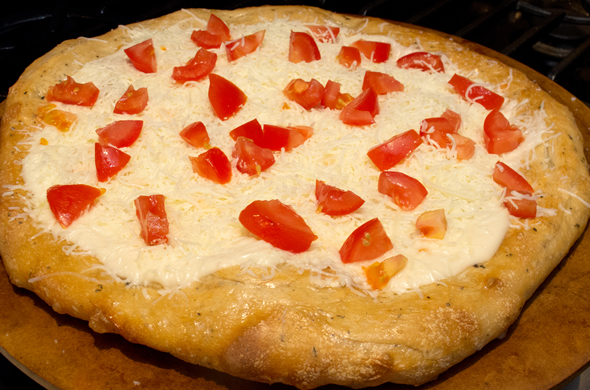 Spread pizza dough onto the pizza stone or pan and bake for 5-10 minutes. 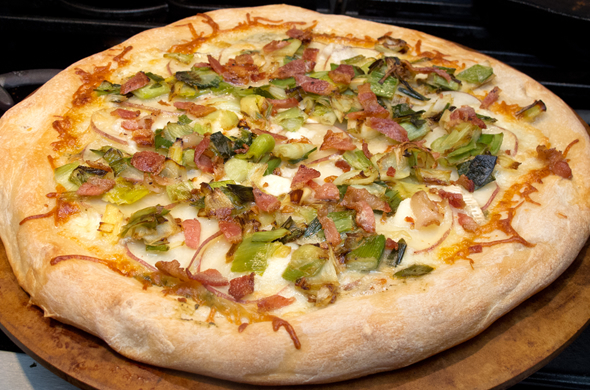 The point is to get it pre cooking so when the pizza is topped, it doesn’t have to cook much longer. Heat a heavy skillet to medium and add butter & oil. Toss the scallops in the four mix and pan sear each one for about 2-3 minutes on each side, flipping once (they’ll go into the oven again too so don’t overcook). When the pizza dough is pre-cooked a bit, remove from the oven. Reduce temperature to 300 degrees. 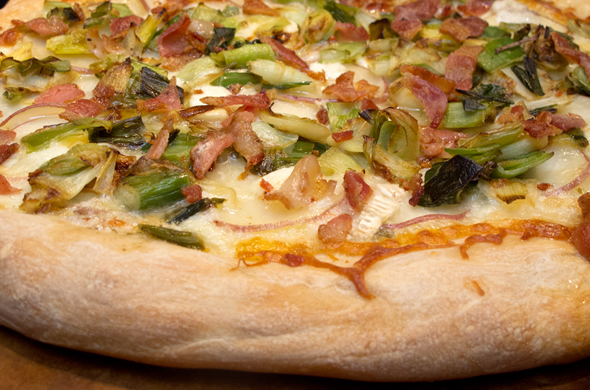 Top the crust with alfredo sauce, cheese, bacon, and tomato. 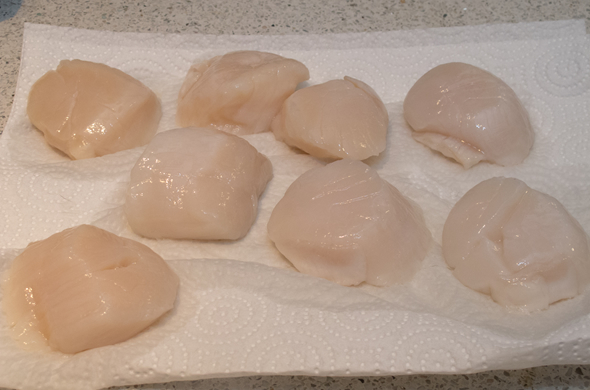 Cut scallops in half horizontally, or into quarter chunks if you prefer. 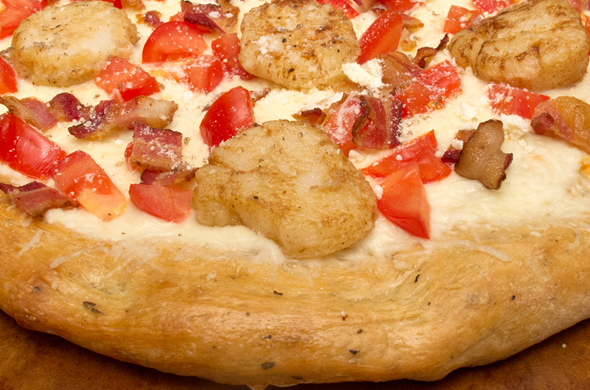 Add cut scallops to the pizza, with the seared side facing up. 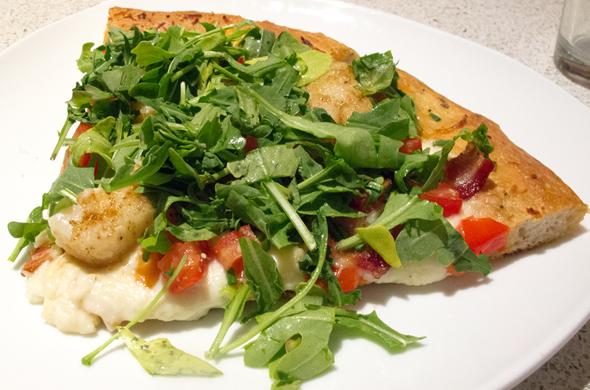 Toss arugula with a very little drizzle of olive oil and add onto of the pizza. I added a little sprinkle of Parmesan and chives before the arugula, mostly because I had some. I liked everything that was going on for this pizza. 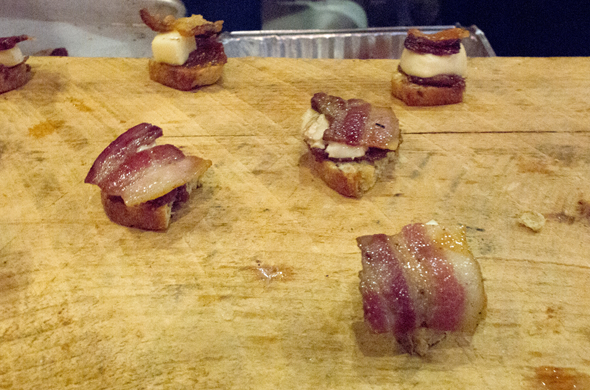 It was reminiscent of bacon wrapped scallops. This is seriously a cheap way to serve scallops. I bought 3 scallops for 2 of us. I did slice them in half but there were lots of pieces to spread over the pizza! Bay scallops aren’t the same but maybe I should branch out for meals like this. I also only used 2 slices of bacon. It seems like plenty when spread around. I would always like more, but this amount is the smart choice. I pre-portion bacon and freeze it. Otherwise a pound can disappear verrrry quickly. Now that the 4th is over, the pressure is off for your food to be red/white/blue. Phew! I was thinking this pasta salad was getting so hearty that it didn’t really need to just be a side, I thought it could be almost the whole meal. 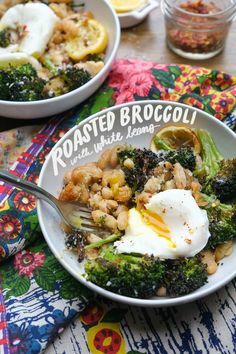 I put it on salad with a few more veggies and thought it was great! 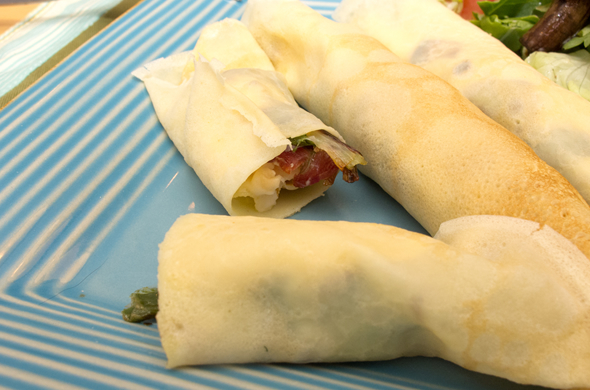 In advance: mix yogurt and dressing packet together and refrigerate for 3+ hours. Boil pasta until cooked through, but just a little al dante. (I cook it longer than when I prepare hot pasta). Chop tomatoes, cucumbers, and bacon. Mix dressing onto room temperature pasta. Chill for an hour-or-two before serving. 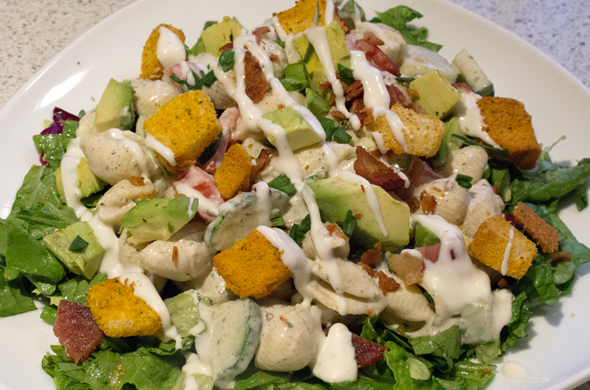 Serve as pasta salad or on top of a green salad. 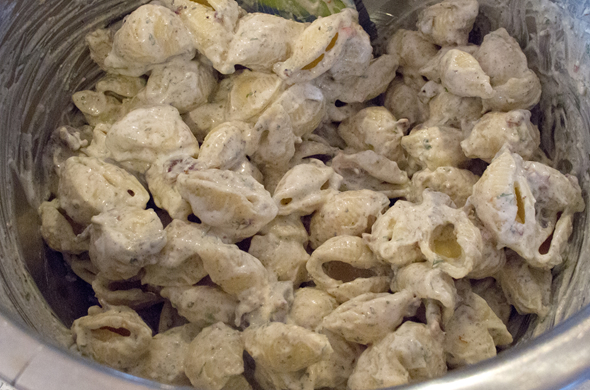 Basil would have been a good addition to make the pasta salad be more BLT instead of the lettuce. I used Greek yogurt to up the protein and lower the fat from mayo. 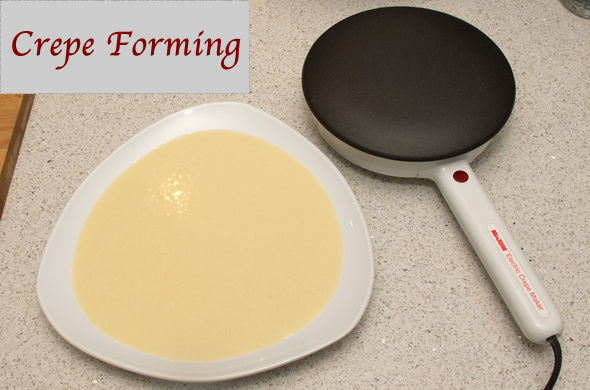 If it dries out, add a tablespoon or two of milk to get it creamy again before serving. There are pretty much a million substitutions for this one…ready? go! I was feeling like dinners had been too wintry and I wanted something springy. I’m ready for spring and Boston sure feels fresh and rejuvenated. We are on the mend and with a springy-feeling drizzle and a sunny hug this weekend helped us heal and move forward. I spotted leeks at Trader Joe’s. Thanks to Joe, I didn’t have to slice and soak. 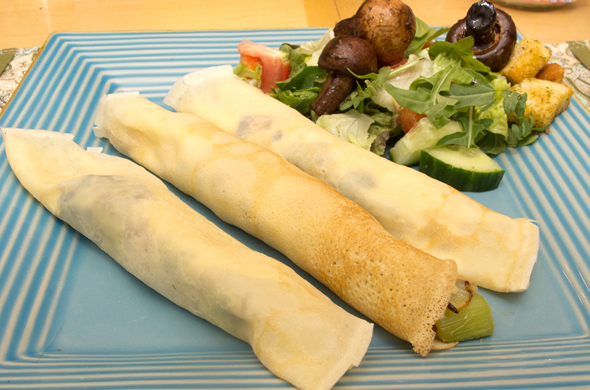 It also meant I didn’t have to try to use leeks in everything I cooked from now on. 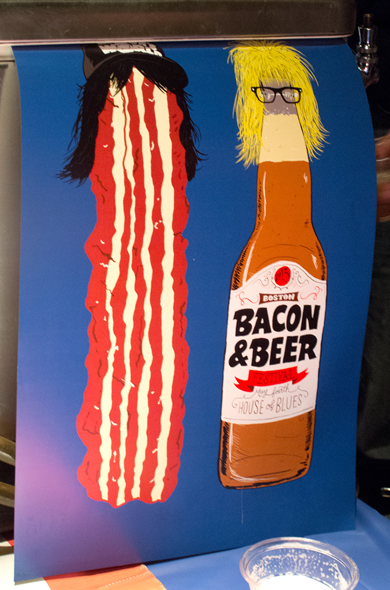 Ms. L was coming so I figured bacon was just the addition she would appreciate. All hell was breaking lose at work. I needed to make this delectable pizza. I needed something I could do well. I’m sure Ms. L would have understood if I was too overwhelmed. When other things are going wrong, I just want dinner to be comforting. Preheat oven and pizza stone if you’re using one to 400 degrees. 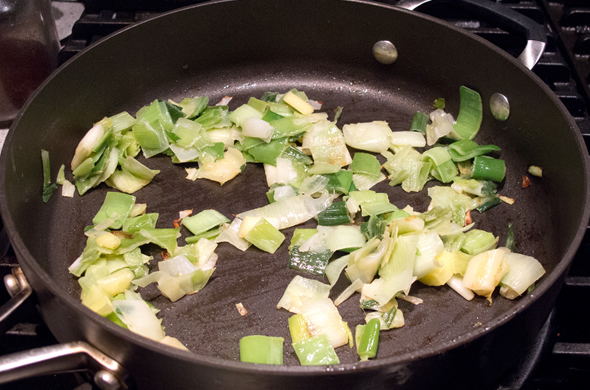 Saute leeks in butter and olive oil until cooked through. Spread pizza dough onto the pizza stone or onto a lightly greased pan and poke a few holes with a fork. Pre-bake the dough for 10 minutes until the dough puffs and is somewhat cooked, but not crisp. After removing the dough from the oven, spread pesto onto the dough. 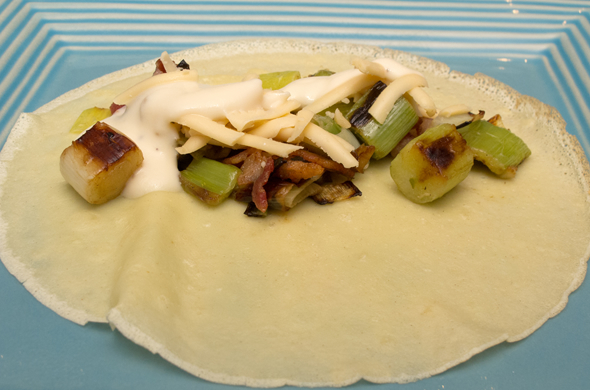 Top with shredded mozzarella, sliced potato, leeks, soft cheese, and crumbled bacon. Return to the oven for 20 minutes until the crust crisps and the cheese melts. 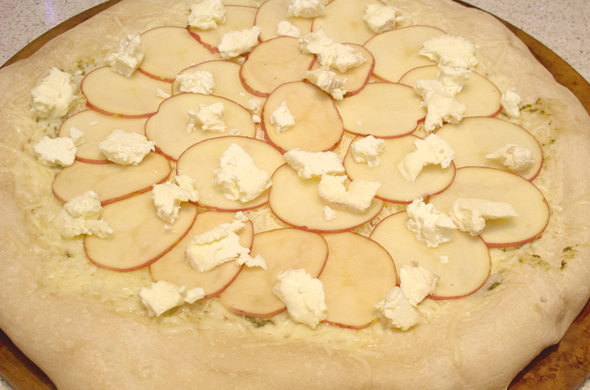 Remove from the oven, and let sit for at least 5 minutes before cutting. This was so good. 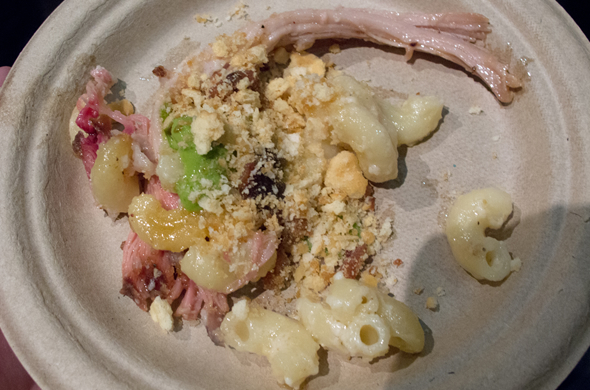 The two cheeses were perfect. St. Andre crumbles like butter and is like brie, times 10. The cheese plus potatoes plus bacon was so well balanced. 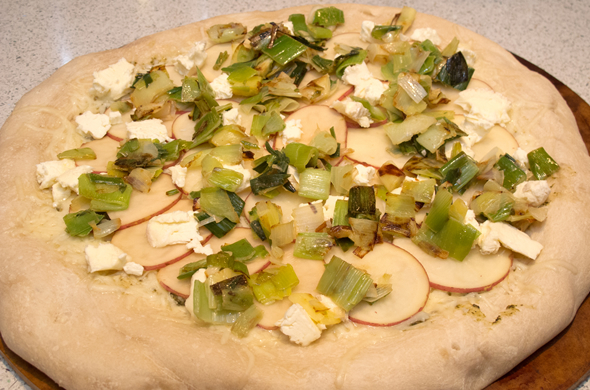 The leeks are fresh almost oniony almost garlicky. 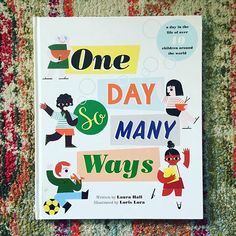 I loved this and will make it again, for sure. or I-don’t-like-traditional-breakfast-food. It has the perfect grease requirement for hangovers and the ideal fresh factor to make up for unhealthy indiscretions. 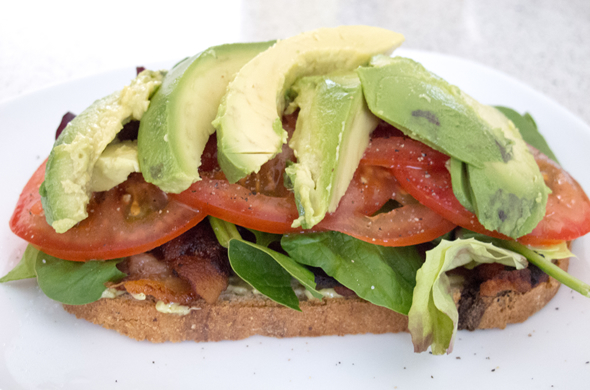 I think BLTs are perfect for a quick dinner or even brunch. They’re great on whatever bread you have, rolls, wraps, biscuits, flatbread, bagels, pita pockets, anything! I added some pesto aioli and some avocado. Perfection! Mix up some mayo and some pre-made pesto. Also, if you refer to it as aioli, even people who think they don’t like mayo will be alllll about it. I grilled the bacon in a criss-cross lattice pattern. Bacon in every bite! I like it suuuuper crispy but bacon in any form is perfect. Layer it up! I like it in the order of B then L then T. I added avocado to make it more special, filling, and creamy. 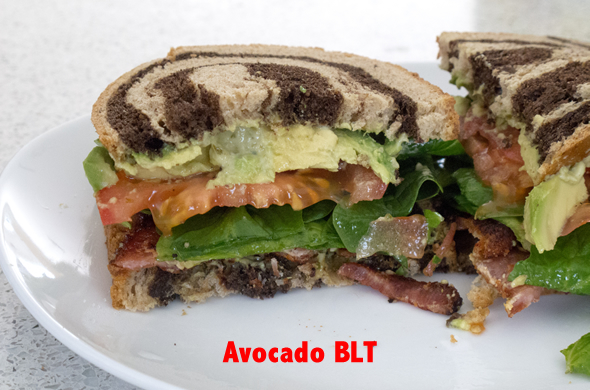 I think there are tons of fun ways to keep a BLT interesting. I think a salad-y wrap would be good too. 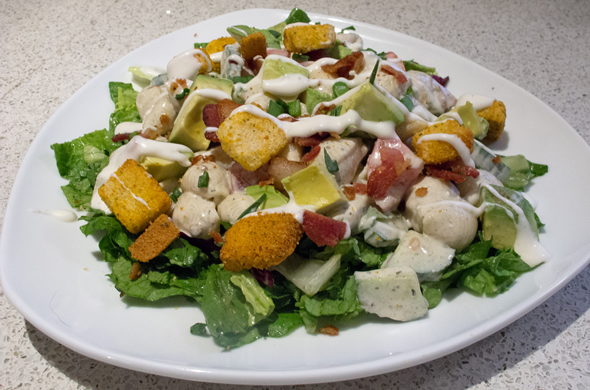 Maybe the lettuce and tomato in chunks mixed with ranch, avocado, and bacon! Ooo. Yum! 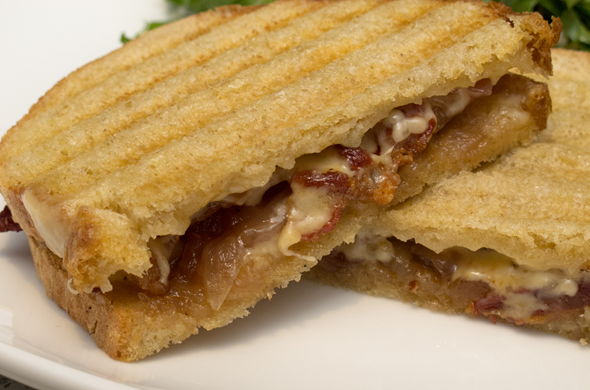 A BLT grilled cheese would be delicious right about now. Or maybe a BLT with fried egg on ciabatta! I’ve made BLT pizza (which was to die for). Just goes to show you, BLTs are great inspiration. What do you do to keep sandwiches interesting? 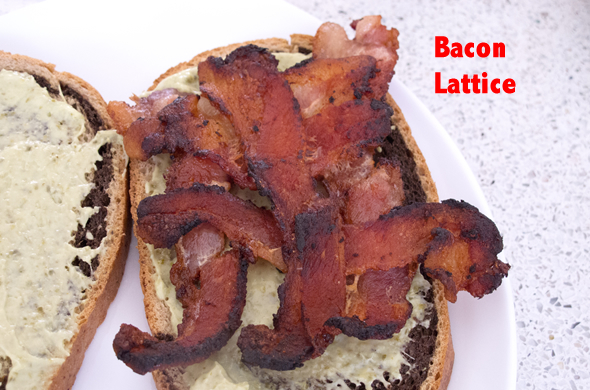 Any BLT variations I should try next? 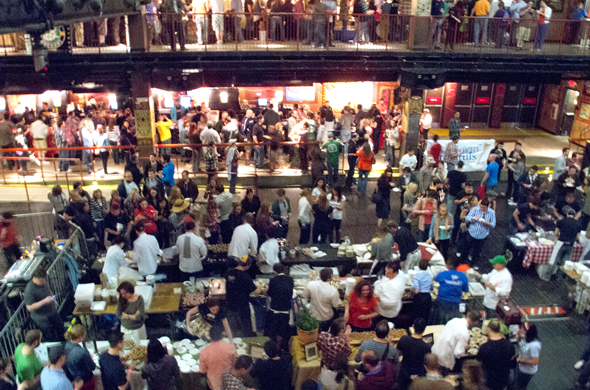 Are you stuffed and/or hungover from the Superbowl? This won’t undo any goodies you munched yesterday, but I thought: what food should be the morning-after the Superbowl? Answer: soup! I’m trying to change people’s impression of soups. I fear they get a bad wrap for being not filling, or for lacking flavor. This recipe has been hanging out a bit because I made a creamy sherry tomato soup and pizza Soup ‎and roasted cauliflower soup all somewhat recently and I thought you might get souped-out. Not to worry though, I have a lighter soup Momma just made that is beyond words amazing. I’ll make it soon-ish. 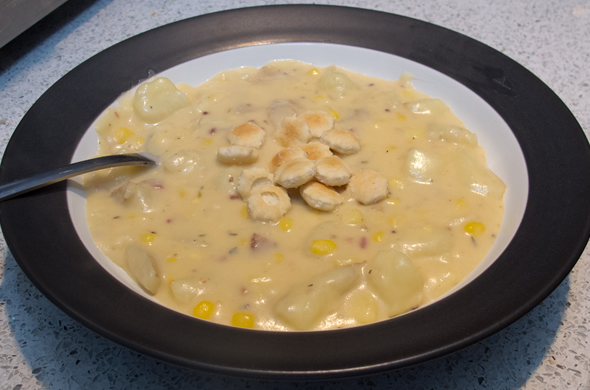 If nothing else, soup helps vary dinner ideas now and then. 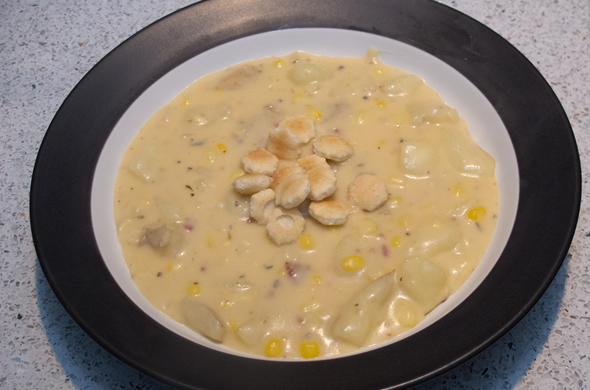 This corn and bacon chowder is not exactly the healthiest soup, but the flavors are delightful. I based it off of Tyler Florence’s recipe and loved it. 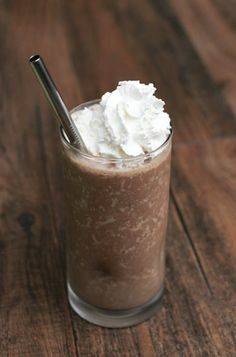 I shaved off some heaviness and calories by using half cream and half low-fat milk. I also used wine in place of some stock. 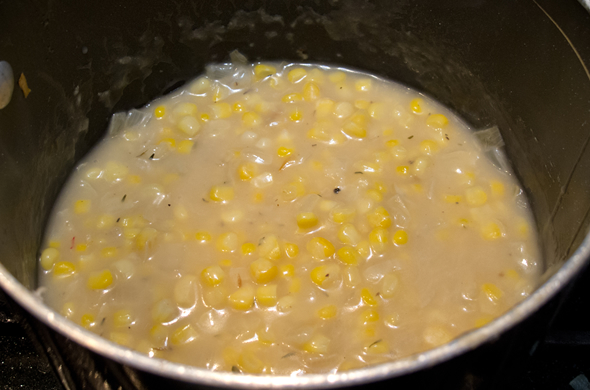 This is a great spot for whole wheat flour since it is only thickening the soup. Saute onion in butter until translucent and cooked through over medium heat. Add garlic and flour, stirring well before adding stock and wine. Cook over medium-high heat, gently boiling. Add potatoes and milk to the pot cooking at medium-high heat. Stir well, allowing potatoes to break down slightly. Bacon, liquid smoke, and spices, and stir to combine. Cook for an additional 5-10 minutes. I did the whole thing in 1 pot and 1 pan. Score! I boiled the potatoes and when I drained them, I started the soup in that same hot pot. I love the bacon in here and the liquid smoke plays off that a bit. I think the bacon adds a depth and difference to the sweet corn that is necessary, not optional. I think the herbs could really be anything you have/love. Sage might be interesting? Tyler uses parsley. Basil always makes me think of lightness/freshness. I love chives (and they’re about the only thing I can grow). Have I proclaimed my love for liquid smoke? I recommend adding it to traditional chili, soups, butternut squash enchiladas, etc. It seems like a special ingredient, but it ends up going with everything. It also doesn’t go bad for about a million years and you only use a little at a time. Ok, are you sold? I didn’t freeze any of this soup. Cream based soups can seem kind of texturally off after being frozen to me. This made about 4 sizable portions for dinner & lunches. Happy New Year! December included a vacation then the whirlwind of the holidays in MA & ME. It was an awesome few weeks but I feel like now it is is major detox time. Time to eat real food and get back to the routine. There were some amazing meals on vacay, Christmases with both families, holiday parties, a cookie swap, some festive beverages etc. 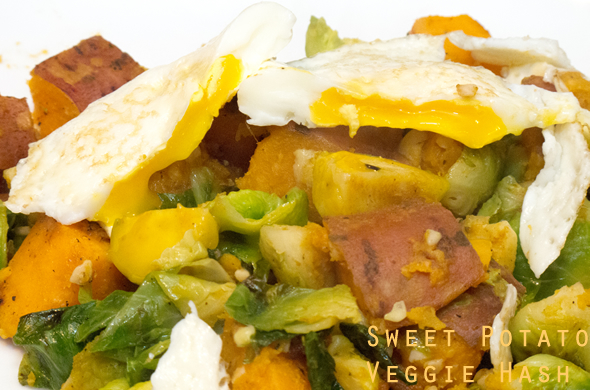 I spotted this easy sweet potato and brussels sprouts hash on Culinary Colleen’s blog. It looked awesome for brunch. I thought it could be an easy and balanced dinner. 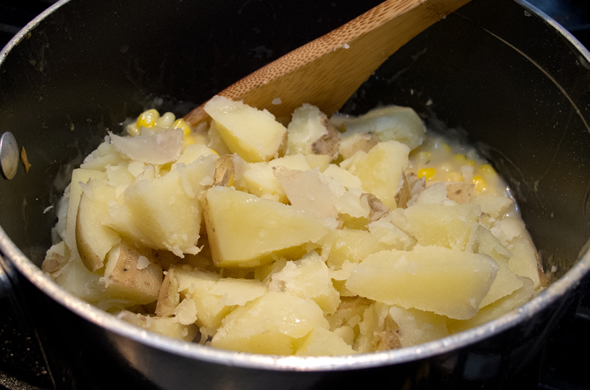 Partially boil the potatoes and cook until the potatoes are halfway cooked. Steam the brussels sprouts while pan frying the bacon. Drain the bacon, leaving the pan coated with bacon grease. 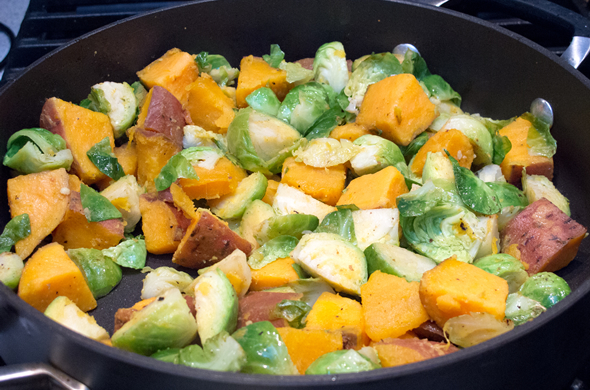 Cook potatoes, brussels sprouts, and garlic in the bacon pan. 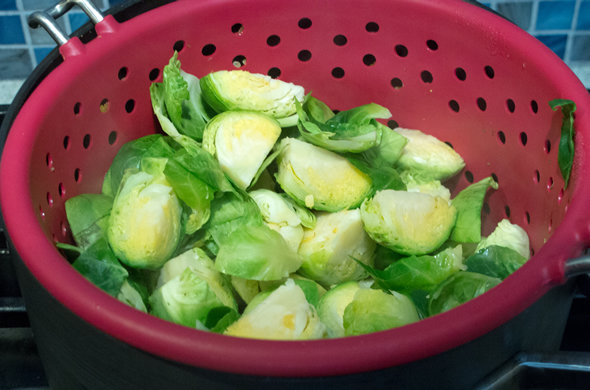 When potatoes and sprouts are getting gently browned and crisp turn to low and keep warm. Add bacon just before serving. 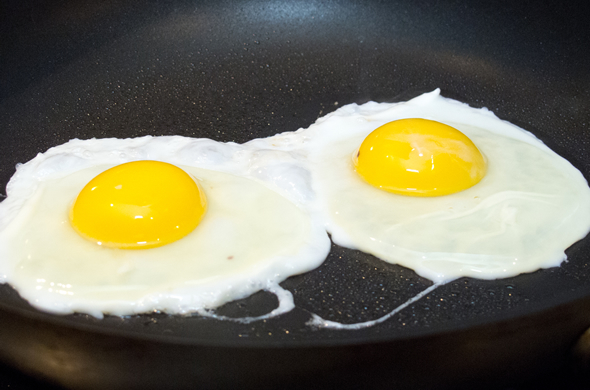 Pan fry eggs over easy, or poach the eggs. Serve eggs over the potato and sprout hash. I liked this. It was super easy. I think I should have dripped in a little liquid smoke, but the bacon gave a great smokiness. I don’t think I’d crave this weekly, but it was a nice change up and was only 1 pot and 1 pan to make. Love that! 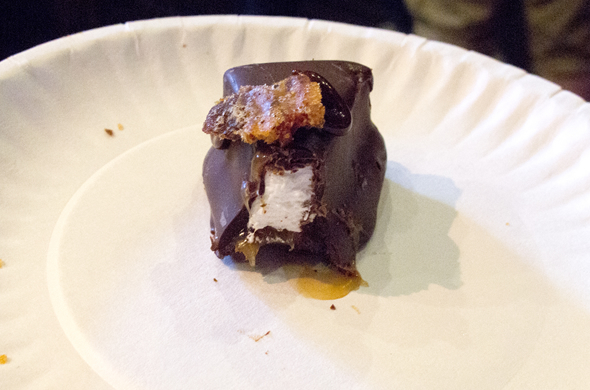 There aren’t enough foods wrapped in bacon. 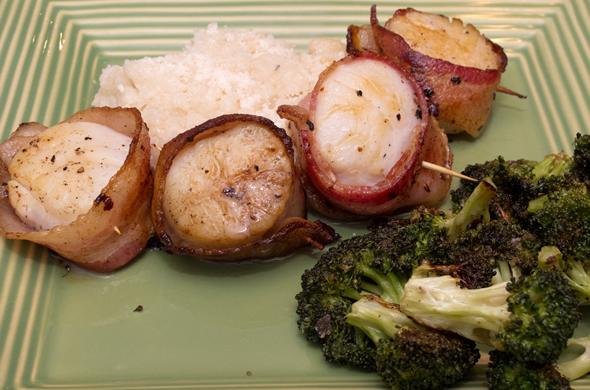 I can sense when scallops wrapped in bacon are a passed appetizer near me. It is like radar. I work the cocktail hour scouting what waiter has them near by. I decided I should make some myself. I think the challenge was really to get the bacon crisp and not to overcook the scallops. 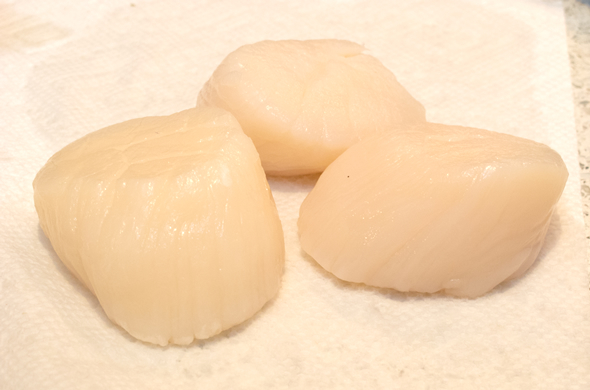 Rinse scallops and trim any connective tissue. Pat dry. Again, pat any excess water off. 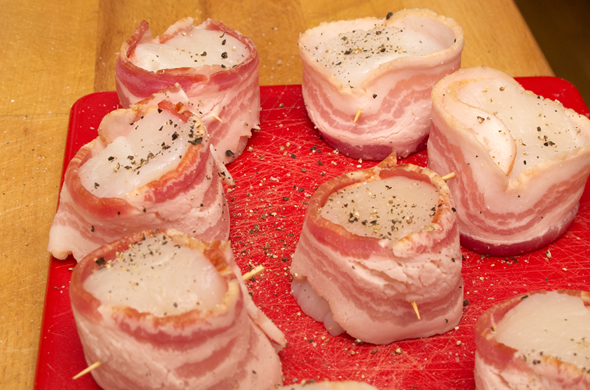 Wrap each half strip of bacon around each scallop and secure with a toothpick, through the center. Or try using 2 to make an X to get it going. Generously salt and pepper both sides. Melt butter and oil in a hot skillet. Place scallops in, bacon side down. 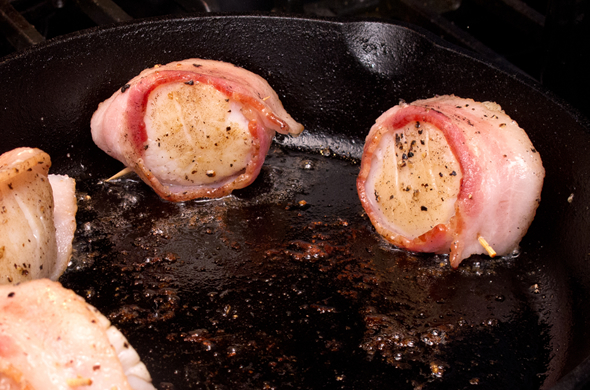 Don’t overcrowd the pan so you can rotate the scallops, crisping the bacon on each side. 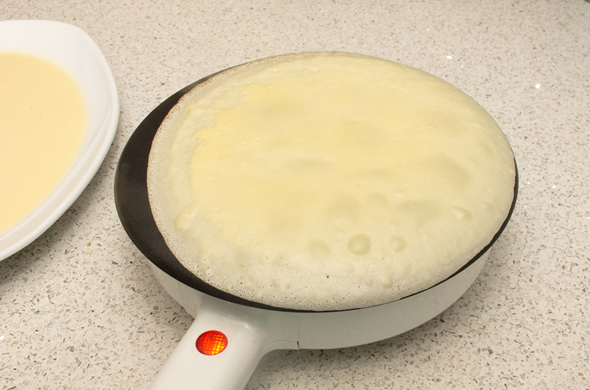 At the 4th rotation, pan fry both top and bottom. These were tricky. I made sure to (account for and) pull out each before serving. The bacon held well. If anything, they weren’t quite as crisp as I would have liked. I think the scallop maintained its integrity. Four scallops per person was too much. They were huge! I served them with some roasted broccoli and parmesan risotto.